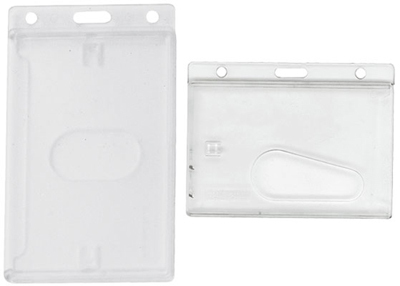 Frosted Rigid Plastic Vertical Closed Face 1-Card Dispenser with Thumb-Notch, 2.44" x 4.13"
1-card access card dispenser with thumb notch and slot/chain holes. Card is enclosed; and removed from holder using the thumb. Vertical and horizontal options, frosted white. With perforations for neck cords/chains and lanyards.